Episode 08 – “I’m Not a Hotel!” In the wake of last week’s preview, teasing Yamato’s appearance, I waxed naivete and told myself I would build her in the game before this episode’s premiere. Well, wouldn’t you know it, after 13 months of playing KanColle I finally built Yamato in the very resource expensive Large Ship Construction. I thought it was going to be Musashi, who might be one of my least favorite ship designs, but luckily I managed to be lucky for once in my KanColle career as a digital admiral. The memes don’t lie either, Yamato is the very definition of a resource sink. I have some slightly mixed feelings about this episode. Considering the Yamato is the most famous Japanese warship, who’s claim to fame is being so big and powerful (the most powerful ever created in the world) even spawning its own anime series Uchuu Senkan Yamato, it makes sense that they would devote an entire episode for her. And I’m glad they did, because I really like her design and she has a cute personality, but I can’t help but feel that the premise for this episode was a little contrived. Though, I suppose the production didn’t have all that much to go off of if they wanted to base the episode off of her moniker as the “Yamato Hotel,” due to her inactivity in the war. 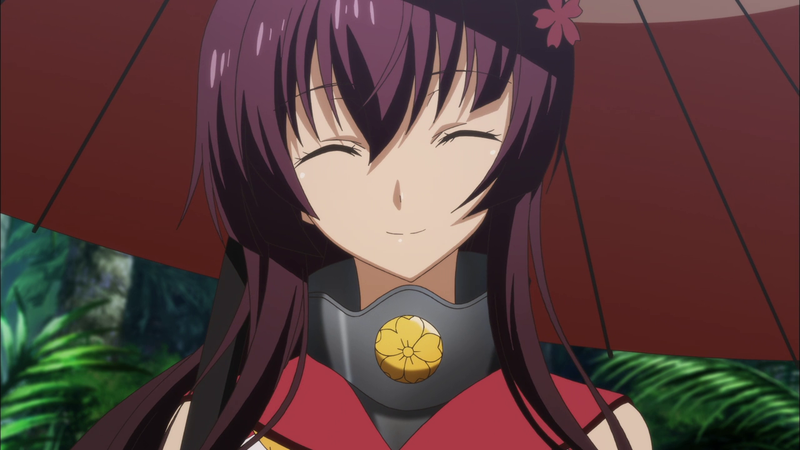 I could complain how screen time that could have went to developing Yamato’s story was misused, but considering that we got to see Nagato make cute faces at chipmunks, I would be completely in the wrong there. Also, how about those beach scenes? Roll your eyes all you want, but I find it incredibly amusing when a series that takes place entirely near the ocean has a beach episode, and I was reminded of my surprise at Free‘s beach episode. The destroyers provided the school mizugi fanservice here, given the strange absence of submarines in the anime. While the story execution admittedly isn’t great, there are some genuinely good moments between Yamato and Fubuki. On the surface, it seems that Fubuki is simply being a pushy busybody by trying to get Yamato out on open waters, but we see that she has good intentions that are motivated by her own experience. It’s been a while, but we have to remember that Fubuki never got to set sail until transferring to this Naval District. She understands the feeling of wanting to surf the oceans like everyone else and the listlessness that comes with it. It’s like being a bird that’s stuck in the nest because it’s told not to fly. So while all of this “hotel” stuff may seem absurd to people who don’t know the historical significance behind it, there’s a very human veracity behind Yamato’s confinement and desire to be set free. I had all sorts of ideas of how Yamato’s first appearance in battle would be like and seeing her fire the infamous 46cm artillery did not disappoint. I’ll even overlook her suddenly apparating her rig out of thin air. Though, I would have loved to see a transformation sequence for her. Maybe they’re saving that moment for Nagato, which I am thoroughly looking forward to. 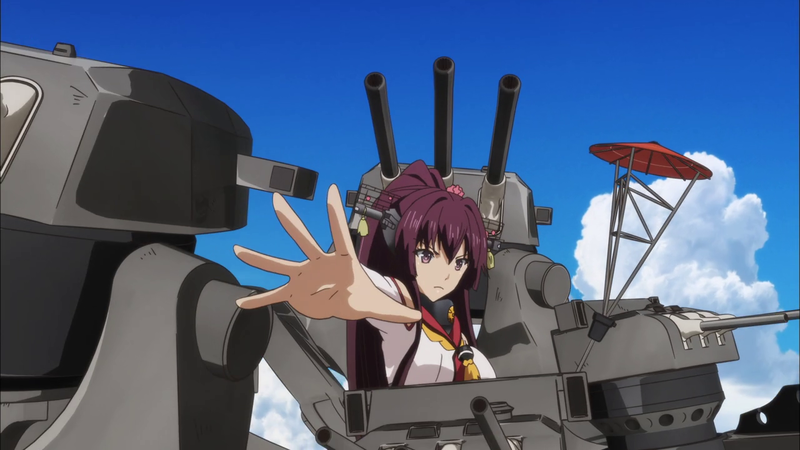 Nagato has her rig in her official art, so it has to happen eventually. Speaking of transformations, it appears that modernizations will be incorporated into the anime, by the looks of the preview! Get ready for red eyes, Banzai Bill torpedoes, and scarves. Double the fun, double the Poi!